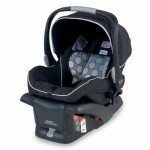 4Moms Mamaroo Infant Seat : It Moves Like You Do! The five unique motions consist of tree swing, car ride, kangaroo, ocean wave, and rock-a-bye. Moreover, there are 5 speeds you can choose, in this way, you can slow down the speed for sleep or speed up for play by pressing the button that is located at the base. 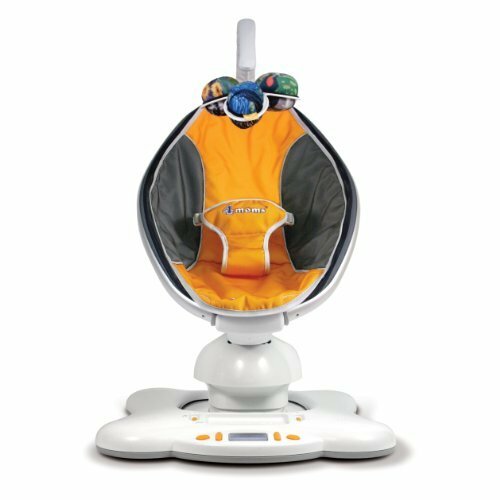 Babies love music, with this in mind, this baby seat offers you five built-in nature sounds to soothe the baby to sleep, however, if you prefer to play other music, you can hook up your music player onto the base. From Beethoven to jazz, hey it’s your choice, some babies do love jazz. This also means that your baby doesn’t have to listen to the same and boring tune every single time. 4Moms Mamaroo Infant Seat comes with 3 removable plush toy balls with beautiful classical art designs (Monet, Van Gogh, Seurat). 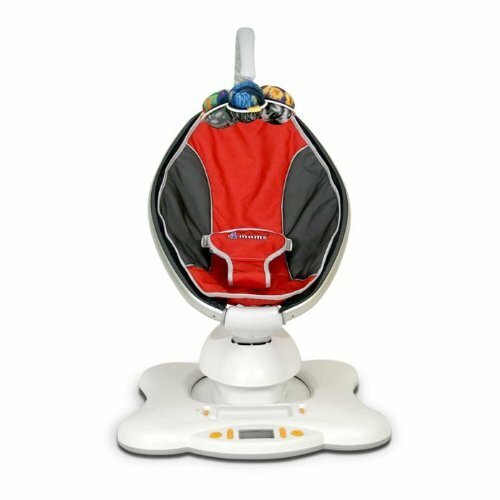 Babies usually love watching these balls or play with them while enjoying the movement of the seat. These balls are black and white on one side and colored on the other, why it’s designed like this? Well, black and white colors are good for newborns, the colored side is good for babies around 4-month old when they start to see color. 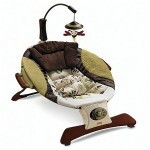 The distance between the seat and mobile bar swings is pretty far enough to enable you access your baby easily yet not too far for visual stimulation. 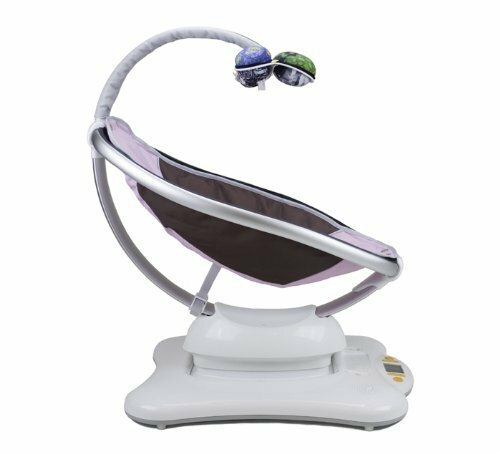 For new moms, you probably think that letting the baby sleep on this seat won’t be safe, well actually if you could setup the seat angle properly (you can have the seat reclined), this unit might save your sanity and give you a good night sleep. There are color options you can choose to suit your baby’s personality, each one has been beautifully designed to fit modern contemporary decor: contemporary green, orange, pink, urban silver, urban black, and sporty red. The aluminum frame is nicely designed and easy to assemble. 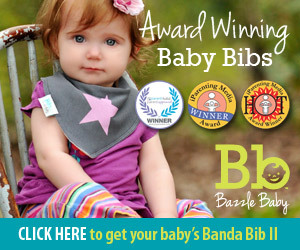 Good news for moms, the fabric is removable and machine washable, very easy to clean. 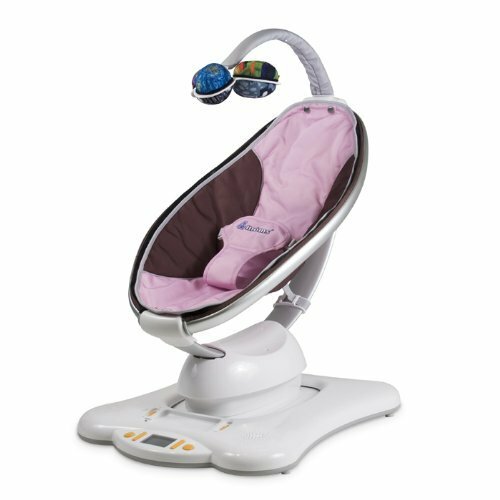 Does 4Moms Mamaroo Infant Seat vibrates and swings like other baby swings? Well, guess what, the answer is no. Why? 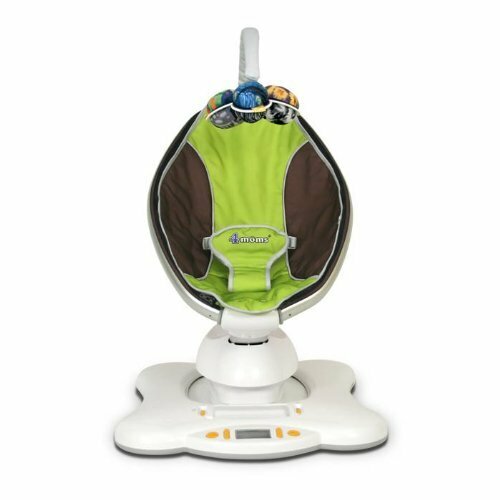 Like we said above, this baby gear stimulates real parents movement when they hold their babies in their arms and guess what, nobody vibrates like a bouncy seat or move like a swing. All they do is bounce and sway, period.